Gears eSports makes its Latin American debut in less than 2 weeks with the now $100,000 Gears Pro Circuit Mexico City Open! 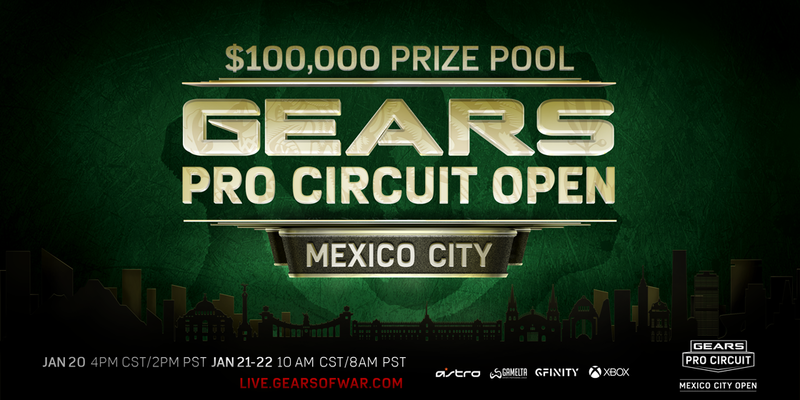 The event will take place live from the Auditorio BlackBerry in the heart of Mexico City starting Friday, January 20th at 4:00 PM CT (2 PM PT, 5 PM ET, 10 PM GMT), and can be watched online at http://live.gearsofwar.com in both English and Spanish. We are excited to announce an increase of $25,000 from the original $75,000 for a total prize pool of $100,000 for the event, thanks to your generous support via Gears eSports Supporter Packs! Looking for more information about the event? Click here for tickets, schedule, and more. 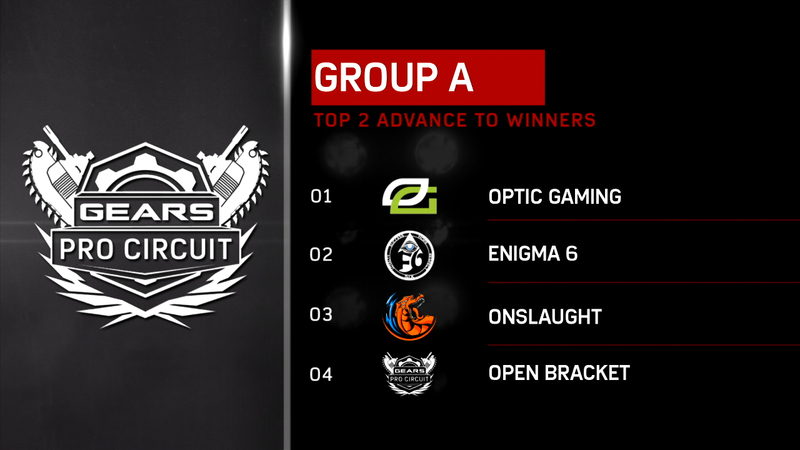 The most dominant team in Gears eSports throughout 2016, The Green Wall looks nearly impenetrable going into the first event of the new year. That said, despite closing out 2016 strong with wins in Columbus and London, the reigning champs have shown they can be beaten, having suffered best-of-3 series losses to both EnVyUs and eUnited in Pro Circuit LAN play. They’ve also shown that beating them twice is a different story, however, as they returned from each loss to play practically lights-out for the rest of both tournaments. Following a relatively disappointing start to their Gears 4 campaign, E6 have exhibited steady improvement since their Gears 4 debut at the Launch Invitational. Although their recent 5th place finish at the Gears Pro Circuit London Open came with European all-star Jack ‘Reaxion’ Oliver filling in for an absent Hudsonz, E6 appears to have turned a corner since picking up Ryan ‘Wildebeast’ Gant, and undoubtedly have the talent and experience to make a deep run in their first Pro Circuit event as a full team. Onslaught make their return to Gears eSports, after recently picking up the 2nd seeded team from the Latin American region. The squad formerly known as AfterDark eSports features a mix of new and experienced players, including former Splyce member Involving (now playing as Cryticxl), who has also assumed the role of captain for the team. Although claiming the 2nd overall seed in a region as strong as Latin America is no easy feat, the new Onslaught squad undoubtedly faces an uphill battle in their international debut, especially considering they happened to draw into a pool consisting of OpTic Gaming and Enigma 6. The undisputed champions of the Latin America region, the core of Splyce’s roster have been nearly unstoppable in regional play since coming together in Gears 3. Although they have failed to crack the top 5 yet at an official Pro Circuit event, they’ve come painfully close, held their own against the world’s best, and it’s likely just a matter of time before they breakout into a top 5, or even top 3 finish. The Echo Fox squad making the trip to Mexico City is considerably different than the one that debuted with a 3rd place finish at the Columbus Open before taking 5th in London. Xcells and Soto, the team’s veteran leadership and primary shot callers, have parted ways with the organization, seemingly trading places with former eUnited members Kyle and Clouts; Fragou7, who was released prior to their departure, has been replaced by KO, and; Gears vet Noah ‘Prison’ Burkholz makes his return to the competitive Gears scene to take over as the team’s coach in place of Jovon White. That all said, the new Echo Fox line-up has performed well since coming together despite these big changes, and could very well continue the team’s streak of top 5 finishes when they make their LAN debut in Mexico City next week. Like fellow Pool B team Echo Fox, the Panda Global roster entering Mexico City looks considerably different than the one that made the trip to London in December… though also perhaps familiar to many. KO and Phenomxnon are no longer with the organization, and have been replaced by Strangulate’s former Synergy teammates Nastty and Noxious Hero. Now, for those unfamiliar with the competitive scene in Gears 3, Synergy (which was rounded out by Allegiance’s Yogurt) was one of the top teams throughout the game’s competitive cycle, taking home two Hypefestation championships and seldom placing outside of the top 3. Although their Gears: UE reunion perhaps didn’t yield the results they had come to expect as a squad, they certainly have the individual skill and experience to make a deep run in Mexico City. The Boys in Blue go into the Gears Pro Circuit Mexico Open looking to bounce back from a relatively disappointing outing in London, where they failed to reach the Grand Finals of an event for the first time since joining the Team EnVyUs organization. That said, although we’ll have to wait and see how the team performs come Mexico, they appear to already be well on their way in their return to form, with second place finishes at the Battle on the Strip event in Las Vegas and a pair of weekly 2K tournaments, and; a championship winning performance in the online IGL Tournament earlier this month (at the expense of chief rival OpTic Gaming). With the squad taking full advantage of the resources levied to them by their esteemed organization, Team EnVyUs looks primed and ready to return to the head of the pack at the Latin American event next weekend. Practically untouchable in the European region, Epsilon have also established themselves as one of the premier teams on the international stage. With top 7 finishes at each Pro Circuit stop thus far, victories over some of the top teams in the world, and the ability to keep it close against the best in the game, Epsilon appears poised and ready to take the next step at the $100,000 Mexico City event. Though it was a while ago, HeavenlyZ proved during the inaugural Gears Fight Nights broadcast that Splyce is not the only team that can bang in Mexico, forcing the regional champions to a 13th round on each map of the series. That said, although HeavenlyZ, who enter the tournament as the third ranked team in Latin America and have managed to maintain their level of play in relation to the rest of their region; they have the unenviable task of making their international debut against two of the best teams the world has to offer in Team EnVyUs and Epsilon. eUnited followed up their 4th place finish at the Gears Pro Circuit Columbus Open by taking 2nd in London, where they advanced to the Grand Finals after relegating OpTic to the Losers Bracket in one of the best matches we’ve seen on the Pro Circuit to date. Unsatisfied with this second place finish, however, the organization decided to part ways with long-time member Kyle and relative newcomer Clouts following the event, more-or-less trading them for Echo Fox stars Xcells and Soto. Although we’ll have to wait and see if this move benefits them come Mexico, if Xcells and Soto can pick up where they left off with Echo Fox and bring the calibre of play we’ve come to expect from them to this already potent lineup, it wouldn’t be a surprise to see eUnited return to the Grand Finals for the second event in a row, and even come out on top. Team Allegiance, formerly known as Revenge, made a name for themselves right off the bat by going into the Gears 4 Launch Invitational and ousting MindFreak, NRG, and eUnited to take third in the first event for Gears of War 4. Since then, they’ve finished 5th in Columbus, 3rd in London, have well-established themselves as one of the premier teams in Gears eSports, and seem to only be getting better as the International Pro Circuit rolls on. The fourth place team coming out of the Latin American region, Aztek Gaming comes into the Mexico City event having placed 2nd in three regional 2K tournaments, and 3rd in several others. How this relative success online will translate into the LAN environment against premier international teams remains to be seen, but Aztek Gaming is undoubtedly a considerable underdog going into their Pro Circuit debut, especially considering they share a Pool with top teams eUnited and Allegiance. Click here for more information about the event, including tickets, schedule, and more. Don't forget to tune in starting Friday, January 20 at 4:00 PM CT at http://live.gearsofwar.com for the event and your chance to win great prizes.